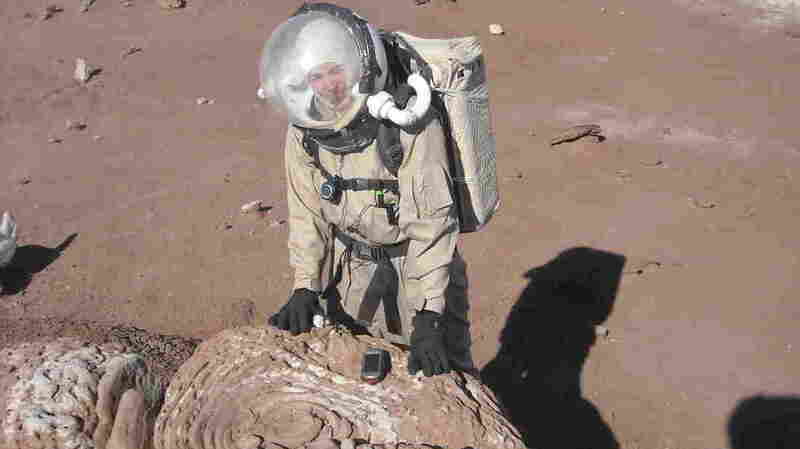 An Aspiring Martian Continues To Pursue The Red Planet Heidi Beemer has dreamed of going to Mars since she was 8 years old. In January, NPR talked to her about her application to Mars One, which is still pending — now she explains she has a plan B, too. Lt. Heidi Beemer, shown at the Mars Society's Mars Desert Research Station in Utah in 2011, recently returned to the station for a simulation test for the Mars Arctic 365 program. Since childhood, she's dreamed of traveling to Mars. 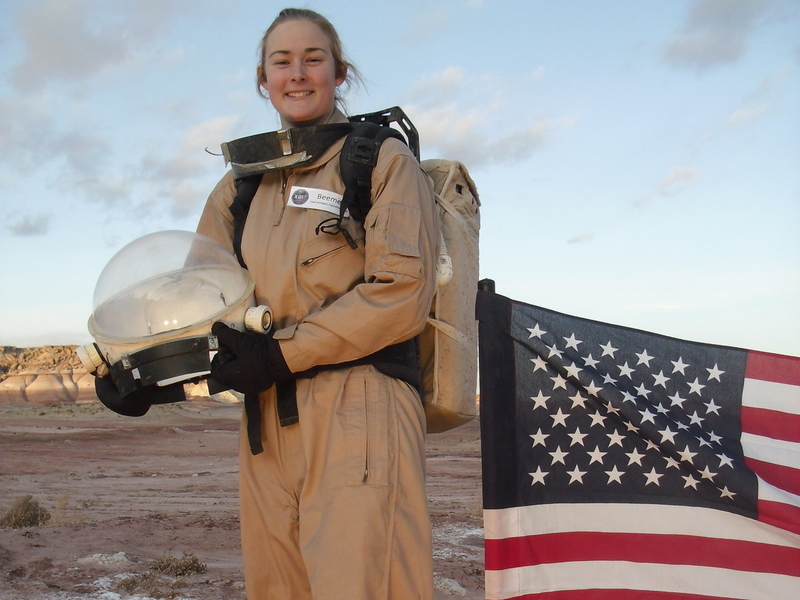 Lt. Heidi Beemer has dreamed of going to Mars since she was 8 years old. She's carefully planned her life, from her education to her career, with a goal of getting to the red planet. Beemer's passion for the Red Planet goes back to an article she read in 1997 about the landing of NASA's Sojourner rover. She says that when she saw what a little rover was capable of, she knew we needed to send people there. Mars One plans to have the final round of astronauts selected in 2015 — about 40 or 50 applicants. They'll spend the next decade training at stations just like the one in Hawaii. Starting in 2024, the first set of four astronauts will set off on the one-way journey. In January she got a step closer to that goal by making first cut of applicants for Mars One — a Netherlands-based nonprofit that has a goal of establishing a permanent, sustainable human settlement on Mars by 2025. Now, she's preparing to interview for the next round. But Beemer is so determined that she has a plan B. She's one of 21 finalists for the Mars Society's Mars Arctic 365 program — a one-year simulated Mars exploration mission planned for next year in the high arctic. In December, she finished a two-week simulation test for that mission at the Mars Society's Mars Desert Research Station in Utah. "Everytime you went outside you had to wear a spacesuit. And you really got that feel[ing], every time you looked out the window, like 'I feel like I'm on Mars,' " Beemer tells NPR's Arun Rath. She says while participating in that simulation, she learned a lot about herself, and about the teamwork and collaboration that would be required on a Mars mission. "It really made me more excited about just knowing that I could feel comfortable in those scenarios and one day, using those skills that I learned while living on Mars again in isolation, in close quarters," she says. But back to her plan A — that one-way trip to the red planet with Mars One — Beemer says that as a candidate, "I've kind of gained a little bit of microfame within my community." Beemer, an Army chemical defense officer with Fort Campbell's 63rd Chemical Company in Kentucky, is passionate about educating children about space. She's traveled to give talks to students and Skyped with classrooms all around the world. Beemer, shown at the Mars Society's Mars Desert Research Station in Utah in 2011, is a candidate for both Mars One and the Mars Arctic 365 program. "Giving kids the opportunity to have aspirations just like I did when I was so young has been so rewarding for me," she says. In February, Beemer will find out if she's made it a step closer to becoming a Mars One astronaut candidate for the proposed one-way mission. "I feel just so honored and accomplished," Beemer says. "It's so crazy that I'm only 25 years old and I'm already part of such a big mission."